I believe you like pets very much and like to play with them, but they are often haunted by the hairs that fall on them and we have thought of many ways to get rid of those falling hairs. Now, our product is the perfect solution to this problem, the unique design can easily remove the pet fall hair, easy to use, the effect is very good. You will love it, try it right now. So that you can play happily with your pet. 1. Gently sweep your fur removal wizard brush across the surfaces from which you want to remove pet fur hair or lint. Follow the arrow when you brush.The brush can capture these on both sides. 2. When the brush is fully covered by the fur, dip it into the base Pull up and down several times.When you take out the brush, it will be clean and ready to catch more fur. 3. When the base is full,please simply take off the cap and empty the fur or lint contents into a trash can.it can be use again like the new one. 【WORKS ON MULTIPLE SURFACES】 - Perfectly used on variety of surfaces, including sofa, car seats, felt pad, plush toys, clothes, and more surfaces which are difficult to vacuum. 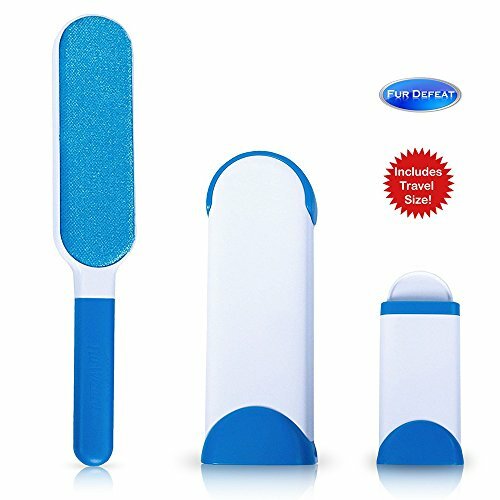 【TRAVEL-SIZE INCLUDED】The travel-size pet fur and lint remover is perfect to keep in your bag or car during your trip. The compact size has all the same features of the standard-sized fur and lint remover. Just pop up the top to uncover the lint brush and use the base as a handle. Dispose the fur through the small, removable collection tray at the bottom of the base. 【QUALITY YOU CAN TRUST】- our product has been rigorously tested and approved by many satisfied pet owners.GUARANTEE - We stand behind our product and offer 100%, 1 year money back guarantee. Your pets will have all the fun in the world - or you get your money back. We guarantee to provide you with the very best, with zero risk! If you have any questions about this product by CODACE, contact us by completing and submitting the form below. If you are looking for a specif part number, please include it with your message.